I never actually tasted a macaron before but heard so much about it. There were so many macarons popping out of blogs and also food forum and they were so beautiful. 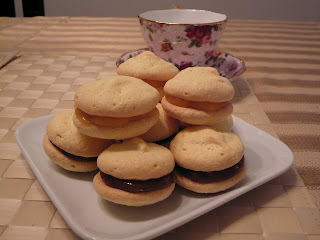 The goal to get a good macarons is with little "feet' around the edges of the cookies and also a smooth tops. Heard that macarons are difficult to make and they were right. Mine turn out really ugly but taste wise it was great except a little bit too sweet for my taste. I might reduce the sugar in my next attempt making it. Hopefully it will look better than these. 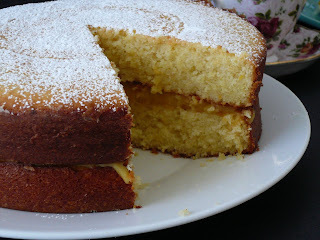 With the leftover almond meal I decided to make an almond cake with lemon curd filling. Your macarons looks delicious. Kasi FedEx lah sikit ke Virginia, boleh? Say hi to your hubby. Thanks Cat for dropping by. Macarons don't ship too well. Sampai rumah you nanti all lembik. Nanti I ship you some other type of cookies. Thanks Gert. I was just joking with you... 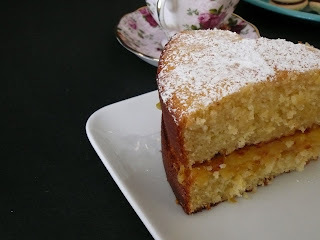 I love your blog.. Lots of recipies. Eh, I have a question. If I wanted to make karipap, what type of frozen dough that I can get in grocery store? Cat, at the frozen section you might be able to find Goya brand empanadas dough. Is all roll out and round in shape. You just cook the inti then goreng or bake the karipap. If not you can just used shortcrust pastry from the frozen section. Are you still having the same e.mail address? I e.mail you a picture of the Goya dough picture. I will PM you my email at myB.